This interview was previously published in Sculpture magazine, 25(6), July/August 2006, pp. 34-9; and also in G. Harper & T. Moyer’s Conversations on Sculpture (2007), pp. 312-17. (International Sculpture Center Press: Hamilton, NJ, USA; distributed by University of Washington Press). El Anatsui art: Earth cloth, (2003). Aluminum bottle tops and copper wire, 487.7 x 457.2 cm. A “cloth” made by sewing thousands of recycled, crushed, and flattened liquor bottle tops. A 10-foot-tall installation of redundant newspaper printing plates used for obituary pages and re-used as sculptural material to comment on temporary— and disposable— human lives. And rough, chain-sawed wood forming a line, an abstracted Visa queue, depicting hopes, dreams, desperation, and global inequality. These are just three works spanning five decades of artistic production by El Anatsui, who is widely regarded as one of the foremost African artists of his generation. His work refers to the history of the African continent, drawing on traditional African idioms as well as Western art practices. Over the years, El Anatsui has exhibited extensively around the globe. His work has been shown at the Liverpool Biennial of Contemporary Art (2002); the National Museum of African Art, Smithsonian Institution, in Washington, DC (2001); the Centro de Cultura Contemporania Barcelona (2001); the 8th Osaka Sculpture Triennale (1995); and the Venice Biennale (1990). Most recently he participated in “Africa Remix: Contemporary Art of a Continent,” which featured more than 70 artists from Algeria to Zimbabwe, as well as African artists living in Europe and North America. This exhibition was on view at the Hayward Gallery during El Anatsui’s concurrent solo exhibition at the October Gallery, also in London. R.J. Preece: When I was in Barcelona reviewing the “Africas” exhibition (2001), I was particularly captured by your piece Visa queue. For me, it’s one of those artworks that stays in your life—it provided an emotive, artistic representation of West African emigration to Europe, as resonant as the documentaries we see of people walking across the Sahara and risking their lives to cross the Strait from Morocco to Spain and into the EU. You created a lyrical line of massed figures, a nondescript mass. Why did you choose such a small scale for this work? Why did you want the viewer to be so uncomfortably monumental in comparison? R.J. Preece: Sometimes artists from non-Western lands feel that viewers can gain significant insight into their works by learning more about their locational/situational context. Sometimes they feel that this is helpful, but it has its limits. And sometimes, it goes overboard and ends up isolating the artist, because the art has been packaged as “specialist art.” Where do you position your work in relation to the “context is necessary” continuum? El Anatsui: People at times see my works without any knowledge of their context or even their titles, and they create their own meanings out of them. Some interpretations reveal how close we are as humans. I would agree that context is both an aid and a hindrance. In certain ways, it helps anchor a message, and depending on the viewer’s capacity and experience, he could go from there and expand or simply stop. I don’t think that I define myself strictly in a locational context. People, galleries, and museums make these definitions for their various reasons—some of them necessary, others not. R.J. Preece: You studied in a Ghanaian university program that was affiliated with Goldsmiths College, University of London. Would your approach, at least during that time, be considered some sort of fusion of Bauhaus-oriented influence and local/regional input? And if so, what range of input would this be? El Anatsui: I went to the College of Arts of the Kwame Nkrumah University of Science and Technology at Kumasi, Ghana. In those days, the staff consisted of several British, German, and American teachers and a handful of Ghanaians. Certainly, foundation courses dealt with elements and principles of art and design, but like most art schools in West Africa at that time, there was not much local content. There was excellent teaching, but the content was simply what the times and circumstances offered. Most of us, after school and further exposure, now combine these experiences with local practices and other approaches. I don’t know what to call it or how to characterize it now. But the concern for principles and elements of design is probably discernible in my works. Take Earth Cloth, for instance. R.J. Preece: What were your influences? El Anatsui: A pretty wide range of things, from media to processes, history, and other artists’ works. I can only pick a few here. Initially, a particular cloth, the Adinkra served as a source, on account of the signs and symbols used on it. These attempted to give visual form to very abstract concepts like “the soul,” “anger,” and “seriousness.” I employed the process of fire engraving or pyrography to work these signs into wood. I have returned to the cloth motif after many years with Adinkra Sasa (Adinkra Patchwork), which references the color schemes (and not the signs) of this funeral cloth. One of the artists whose work influenced me early on was Akwete Kofi, who made massive ponderous wood forms. As I became exposed to the rest of the world, several other artists’ works have been references and inspirations: Anish Kapoor’s engagement with the void or darkness; Antony Gormley’s work— especially the energy generated by many hands touching clay to realize his “Field” series; and Endo Toshikatsu’s use of fire on massive wood sections in his earlier works. While influences continue to grow and expand, I am still interested in what goes on around me. R.J. Preece: How did you go about developing the Wastepaper Bag works? El Anatsui: I anneal, or heat-treat, printing plates, so they are soft enough to crumple with my bare hands. These are stitched together into large sheets, which are then configured into bags of assorted sizes and shapes. I approach printers to collect plates they want to throw away. Ninety percent turn out to be obituary notices or funeral announcements. Even when I collected newspaper plates, there were many obituary pages in addition to news, which has a shorter and shorter life span these days. The information on them provides a demographic profile of the location. Very ephemeral lives averaging 45–55 years, like paper, so easily crumpled and disposed of too soon. But like so much printed material, which survives these plates, the lives they refer to are equally survived by many people. R.J. Preece: And what about Ancient Wall? El Anatsui: The “Wall” series, with the rusty perforated metal sheets, came from thoughts about man’s primary impulses and actions. These sheets were graters used in processing cassava into one of the major staples in West Africa— gari. When I came across huge piles of them in the wilderness, my initial thoughts were about consumption, about the huge quantities of gari that have come out of them. Later, thoughts about food as one of the motivations for man’s primordial impulse to carve and control territory led to the idea of a series of walls. Ancient Wall perhaps references not only how old this impulse is, but also how timeless. The perforations lend a significant perspective. I believe that walls do two things: they block views and hide things on one hand; and on the other, they provoke or activate the imagination and reveal things. Take the walls of China or of Berlin. Their physical presence aroused considerable curiosity in people living on both sides. Thus, walls are opaque to the eyes but transparent to the imagination. The perforations in my walls have the quality of indicating any movements behind them, while not being clear about what these movements are precisely. They hide as well as reveal. R.J. Preece: Looking back, are there key events in the development of your artistic and professional practice? El Anatsui: Let me see. My decision to go to art school, my relocation to Nigeria (in 1975), and several other events: an International Sculpture Conference in Toronto (1979) and a residency in the U.S. a year after that. I consider my decision to take up art a crucial— and probably reckless— one at the time that it happened. I finished high school in a provincial location and had almost no exposure to the world beyond. No idea about art as a career, profession, or practice as I know it now. There was glamour and the lure of established and prestigious professions—those with visible role models at that time, especially those with tertiary education. I only felt that I was going for something I would enjoy doing. When I took the post at the University of Nigeria in 1975, my decision was based on a mixture of adventure and a quest to widen my artistic horizon. The few publications then on African art were replete with references to the Nigerian art scene. Certainly, physically seeing Nok terra-cotta works and the homes of ancient Benin and Ife, and meeting in person most of the key contemporary players on this scene, has been immensely worthwhile. Meeting so many sculptors in one place for the first time at the Toronto conference, I felt that there was quite a lot to experience and to do. At the Cummington Community of Arts in Massachusetts, I started with the idea of exploring the chain saw, which [I’ve worked with] for over two decades now. R.J. Preece: You’ve worked with found ceramic material, found metals, various kinds of tropical and other woods, and scorched railway sleeper ties during a recent installation in the U.K. Are there particular materials that you like to work with? El Anatsui: Wood and clay have been my traditional media— and I still work with them, though more and more unorthodox materials attract me. They contain peculiar and different challenges, which I think open me up more. Take Peak Project for example. Milk tin tops gestated in my studio and mind for some time. For about two years, I searched for what to do with them, until the popular brand name of milk— Peak— suggested the idea. Subsequently, I belted these disks together into large sheets, which are picked up at a point, raised, and allowed to drop several times until they firm up into peaks—probably peaks of consumption. I am drawn more to materials that have been subjected to considerable human use: mortars, trays, graters, tins and, of late, liquor bottle tops. Apart from what their provenance has loaded them with, I subject them to the numerous touches of the many assistants who work with me. I believe that what I explore now is not only material, but also process and logistics, elements that anybody dealing with huge quantities of material and difficult means has to grapple with. R.J. Preece: What have you learned from using a chain saw in making some of your works? I was first taken in by the line—its making and clawing propensity— and I tried to configure C-scrolls and other organic lines but found that these were not in the chain saw’s character. It lends itself to making straight lines, straight cuts, and can deliver many of these, fast. Also, its marks have a loud hustling quality or feel. In Visa queue, I attempted to use this quality for significance, but I think that Erosion (1992) is perhaps more effective in showing this. Made in connection with the Rio Earth Summit, Erosion tried to put the fast summary lines of the chain saw next to slower hand engravings, contrasting man’s mechanized, revolutionary technology with his slower organic, evolutionary culture. R.J. Preece: What issues are you currently facing in your artistic and professional practice? El Anatsui: On the front burner now, I am thinking about relocating and debating whether I should keep a studio in Nigeria and one in Ghana or operate in one location only. These are crucial questions, because the decision will affect what kind of work I create in the future: The rural setting at Nsukka and the urban setting at Tema (Ghana) both generate their peculiar inspirations, materials, and opportunities. R.J. Preece: Future plans? Or future dreams? El Anatsui: I have, for some time now, been dreaming of an art community with more interaction among people. People from different backgrounds, professions, and persuasions. There is no way that this synergy could not result in better understanding, not only of art, but also of the other disciplines. Something similar to this was enacted at the last Gwangju Biennale where we, the artists, were paired with viewer-participants. There were very innovative results in some of the pairings. I am thinking here of something more long-lasting, more intimate but informal. The emphasis is on the various disciplines, and not working in exclusion. 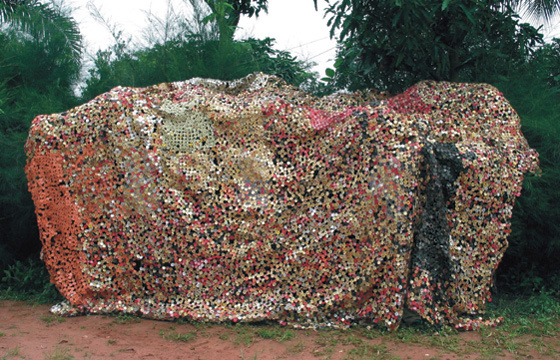 Click to see an interview of El Anatsui in 2014. Click to see an extensive quotation of the Q&A featured by artistic director Robert Storr in the Venice Biennial 2007 catalogue.